"No, sir. You can kick me outta here, but I ain't quittin'!" 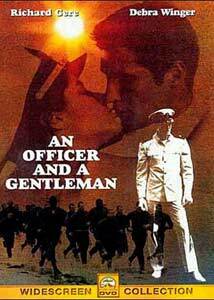 Stars: Richard Gere, Debra Winger, Louis Gosset, Jr.
An Officer and a Gentleman stars Richard Gere as Zack Mayo, a talented but selfish young man who enters the Navy's Officer Candidate School to become a pilot. Under the tutelage of his tough drill instructor Gunnery Sergeant Emil Foley (Louis Gossett, Jr.), Mayo learns discipline, leadership and compassion, forming a relationship with local girl Paula Pokrifki (Debra Winger) along the way. To a great extent, this is standard-issue romantic melodrama—boy meets girl, boy grows up, boy gets girl—Set against a patently Hollywood-ized military training environment. The development of Gere's character is predictably inspirational, from a rough boyhood (an absent military officer of a father, early loss of his mother), to his determined, record-setting performance in the Officer program, to his acceptance of responsibility and a love he scarcely recognized. A subplot involving his classmate Sid (David Keith), whose storyline after dropping out of the program only to be rejected by his pilot-chasing girlfriend Lynette (Lisa Blount), is so heavy-handed as to be almost comical, as is some of the exposition early in the film. Where An Officer and a Gentleman succeeds, almost in spite of itself, is in its casting and performances. Richard Gere as Mayo finds a balance between the character's inner pain and outer bravado that actually works, and even though we all know what's going to happen, his character's growth is still interesting onscreen. Debra Winger does fine work in an underwritten part, communicating a great deal with her eyes and expressions where the script shortchanges her linewise. And Louis Gossett, Jr.'s breakout, Academy Award®-winning turn as Sergeant Foley is consistently riveting—his drill instructor is abrasive and demanding, but visibly human underneath, allowing him to be a tough but fair motivator, not a two-dimensional villain. David Keith and Lisa Blount play their roles with conviction, though they're not given much to work with, and the film benefits from a strong supporting cast, including David Caruso, Harold Sylvester and Lisa Eilbacher as Mayo's classmates, all of whom register as individuals and lend a credible ensemble feel to the film. Grace Zabriskie appears in a small role as Paula's mother, upping the film's coolness factor by her very presence. In the end, An Officer and a Gentleman is still a predictable early-1980's melodrama, trotting out the conventional plot elements so we can all feel upbeat as the credits roll and the pop single kicks in on the soundtrack. But director Taylor Hackford leads his talented cast with a sure hand, finding more substance in the telling than the tale would seem to merit. A guilty pleasure, perhaps, but a pleasure nonetheless. Image Transfer Review: An Officer and a Gentleman is presented in its original 1.85:1 widescreen theatrical aspect ratio, with a fine anamorphic image. The source print has a few flecks of dirt and damage here and there, but the dual-layer digital transfer is well detailed, with just a hint of grain, and the film's earth-tone palette of greens, browns and blacks is captured nicely with good shadow detail. The film's 1982 vintage manifests as a bit of softness here and there, but there's no reason to complain about Paramount's fine DVD transfer. Audio Transfer Review: Paramount presents An Officer and a Gentleman with its original monophonic English and French soundtracks, in Dolby Digital 2.0 for decoding to the center speaker in ProLogic setups. The English soundtrack is dated, with limited dynamic range and faint background hum and noise in a few interior scenes where dialogue was recorded live, but dialogue is clear and the track has a solid presence considering its monophonic nature and the score's over-reliance on its pop Up Where We Belong main theme. The French track exhibits a slightly sterile "studio" quality, but is otherwise comparable in depth, clarity and frequency range. The film's original theatrical trailer is presented in a 1.85:1 anamorphic transfer, slightly grainier than the feature but generally looking very nice. It's a fairly generic trailer, with narration and film clips, but sums up the film's approach efficiently. Director Taylor Hackford contributes a good-natured, talkative commentary track, discussing the film's genesis at Paramount, casting and production process, and story structure as it evolved over the life of the project. While Hackford's body of work has met with mixed critical reaction over the years, his enthusiasm for filmmaking is undeniable and he's a lot of fun to listen to. An Officer and a Gentleman is a standard-issue but highly watchable military romantic melodrama, enhanced by committed performances from a solid cast. Paramount's DVD presents the film with a solid transfer and better-than-average Director's Commentary. Worth a rental, and fans of the film will not be disappointed.